Are you on the hunt for some good deals--and some good cheap kayaks for sale? Well, excellent news: You've paddled your way over to the Bargain Cove! Here you'll find amazing steals of deals on an impressive variety of 'yaks in the Paddlers Cove inventory. If you're looking for a used kayak for sale or special seasonal discounts, this is the place for you. Given the incredible world of adventure and recreation that a high-quality kayak opens up, the price tags on even the most expensive models really aren't unreasonable. These are pinnacles of craftsmanship and durable products; they're investments in years of fun, exploration, and the good health that comes from hours, days, and weeks spent on the water. That said, everyone likes a good deal, right? 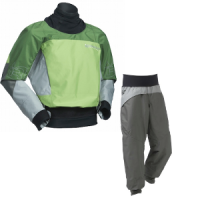 And here at Paddlers Cove, we often find ourselves able to offer a particular kayak or kayak accessory at a specially reduced price. It's our Bargain Cove department where all our highest-value deals live, and where any savvy and pocketbook-conscious paddler does well to browse! Bargain Cove's the perfect place to find an excellent used kayak for sale. 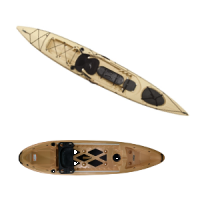 The Paddlers Cove warehouse includes all of the leading kayak brands, and we very often have used boats under the Hobie, Ocean Kayak, Old Town, or Necky stamp at unbelievably low prices. Maybe you're just getting into the idea of kayaking and are looking for an inexpensive model to explore the sport (and the way of life). Or perhaps you're an experienced paddler who already has a 'yak or two in your collection, and you're eager for a knock-around boat as a backup. Or maybe you're simply a kayak junkie who's not necessarily in the market, but who appreciates a well-made model at an irresistible price. A kayak that's been used a bit and then traded or sold to us is certainly still a kayak that may have years and years left in it. We don't sell unseaworthy boats, after all: You can trust a secondhand Paddlers Cove 'yak to be plenty viable on the water. A few well-earned dings or scratches will inevitably drive down the price, but you can think of them as marks of character. A used kayak is a field-tested kayak, "broken in" and ready for more adventures. The deals can be hot: For example, we were recently offering a Riot Lightspeed HV--a blue beauty that had only been paddled once--at almost 50% off. We rate our used kayaks on a scale of 1 to 10, which gives you a great sense of a given boat's condition. We also carry new or like-new 'yaks that we can offer at a reduced rate because they're being replaced by the next generation, we have a manufacturer's discount to pass along, or they've simply worn out their welcome in our warehouse and we're eager to see them freed on a river or lake. Additionally, some kayaks have served as displays on showroom floors but have barely seen the water: We can't exactly sell them as brand-new, but they hardly qualify as "used." Anglers, listen up: It's not uncommon to find some really state-of-the-art fishing kayaks in the Bargain Cove, offered at prices that'll have you rubbing your eyes and doing a double-take. Again, these topnotch fishing machines may have only been taken out on the water once or twice--or never. We lately had one of the best fishing 'yaks around, an Ocean Kayak Trident 13 Angler, available for almost $500 off the list price: It had only seen a few showroom floors. Hobie, Old Town, and other leading brands all produce highly competitive fishing kayaks that differ in a few key design or technological features, so passionate anglers may well try out a few boats before locking in on the model they like best. The cheap fishing kayaks at Bargain Cove pose a great opportunity in this regard--the chance to pick up and trial-run one of the top boats without going all-out in the cost department. Check out the cheap kayaks for sale at Bargain Cove, and keep coming back to monitor our discount storehouse. We're always getting used or showroom kayaks in at the store, so it's a good idea to bookmark this Bargain Cove web page and make regular visits part of your routine. If there's a particular model or category of kayak you're particularly interested in finding a deal on, let the team at Paddlers Cove know and we'll keep a special eye out for you. Bargain Cove--what an awesome place!